A fluffernutter is a sandwich made with peanut butter and marshmallow creme. Its name comes from the common use of "Marshmallow Fluff" brand marshmallow creme. It is particularly popular in the Northeastern United States and has been proposed as the official Massachusetts state sandwich. Left: Fluffernutter before putting together. 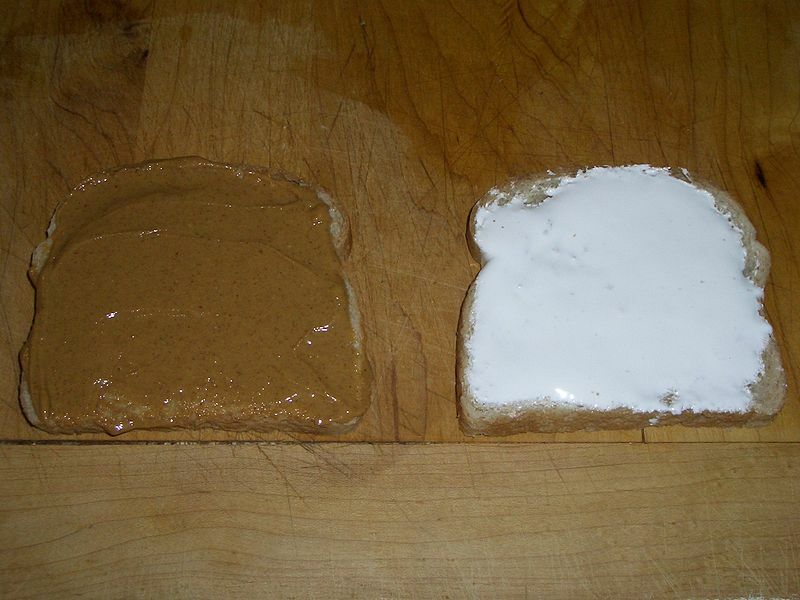 A fluffernutter is made by spreading peanut butter on a slice of white bread, then spreading an equal amount of some kind of marshmallow (small, large or cream) on another slice, and finally combining them together to form a sandwich. Variations of the recipe include wheat bread instead of white, and the addition of bananas, honey, or other ingredients that are compatible with peanut butter.